Lyrical Sanctuary is UWM’s monthly open mic night, featuring standout spoken word artists, live music and art, and YOU! Now in its sixteenth season, Lyrical Sanctuary has brought students and community members together to share their passion for poetry, music, art, and creative self-expression. Prior to each performance, the featured artist leads a creative writing workshop open to anyone willing to put their pen to the page. Be inspired. Speak your mind. Leave an impression. She is committed to uplifting people using her gift of speaking using her love of the art of spoken word. Porter’s work focuses on motivating and inspiring others through their struggles in life. Dual talented: Vikki is poet and a hip-hop artist. Accomplishments: four-time National Poetry Slam team member and has been featured in multiple national publications and anthologies including The Progressive, Burning Word, Dream of a Nation and Positive Impact Magazine. 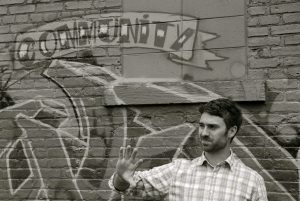 Roles: Ryan is an educator, author and community organizer spending more than a decade organizing for more equitable education systems. Students of UWM will come out and showcase their talents for Lyrical Sanctuary! Come out to support you local UWM talents!